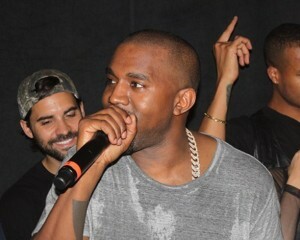 News that Kanye West was pairing up with French brand A.P.C. almost broke the interwebs. Then, the clothes were available for pre-order. And now the $120 plain white t-shirt has sold out. It’s actually one of the more savvy business moves of the year in fashion. 1. He is hip hop’s prince of high fashion. Gawker once wrote that Kanye’s first runway shirt of his designs were met with a resounding “meh.” And mostly, they were right. But he’s certainly rebounded. 3. People really really like his album. People really, really hate his album, too. Put it this way: It was a lot easier for Gatorade to sell Gatorade after Michael Jordan won the championship. When people are buzzing about your work in a good way, as they are with an album, it can only help your other ventures. For all of its critical acclaim, it was received as a piece of art. There isn’t much art in a plain white t-shirt, but giving the people something to talk about? Well, Kanye’s been doing that all along.